Often considered troublesome weeds, dandelion plants are a boon to bodybuilders looking to reduce water retention in their bodies. In order to present the most lean and chiseled appearance to bodybuilding judges, competitors may turn to diuretics such as dandelion in order to release and dissipate the water and sodium around the abdominal region that otherwise may appear as fat. While most bodybuilders opt for herbal capsules that contain 500 milligrams of powdered dandelion root, you may also use a tea decoction to enjoy the diuretic properties of dandelion. Boil four cups of water in a saucepan or pot the day before the bodybuilding contest. 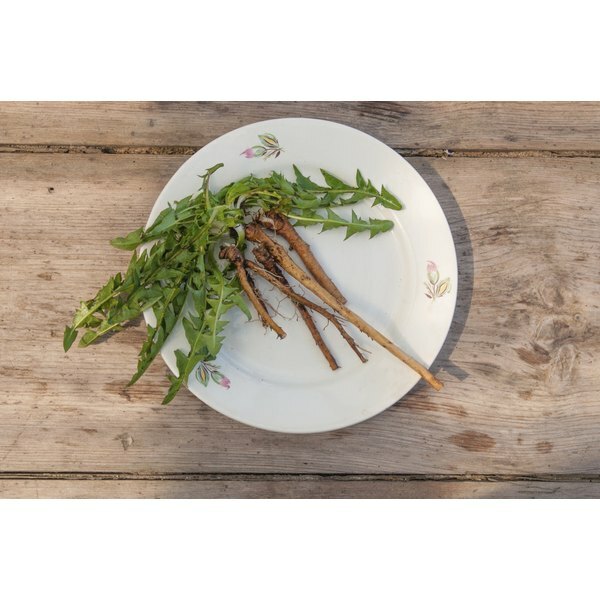 Add 2 teaspoons of dried dandelion root loose herb immediately once the water begins to boil, and let the decoction boil for five to 10 minutes. Remove the saucepan from the burner and cover it with a lid. Strain the dandelion root decoction by pouring the saucepan’s contents into a coffee cup with a strainer covering the mouth of the cup. Continue pouring until the cup has filled, and remove the loose herb in the strainer. Prepare and drink the decoction before each meal -- for a total of three times -- only on the day prior to competition. Consult the label of your powdered dandelion extract capsules to familiarize yourself with the warnings and recommended dosage. Make sure you follow the suggested dose. Take one capsule before each meal only on the day prior to competition, and flush it down with a glass of water. Plan your meals so that you are able to take two more capsules later that day, before lunch and dinner. Drink plenty of fluids up until the day of your bodybuilding contest. While many bodybuilders prefer to compete in a dehydrated condition, this approach, along with the dehydrating effects of diuretics like dandelion root, may cause health problems.